While it's true that some of us may be a little color shy, it's never a bad idea to think about how you can add a dose of bright tones to liven up your interior. One of the more interesting and unusual places to bring color home is in the kitchen. While you may be thinking about a colorful backsplash or maybe even a few candy-hued appliances, there is another place where you can make a big impact with your favorite shades: your kitchen cabinets. Whether sleek and modern or tailored and traditional, kitchen cabinets are the perfect unexpected place for a cool color splash. Here are a few of our favorite shades for turning ordinary kitchen cabinetry into something to remember. First things first. If you're looking to spark some visual interest, particularly without giving a lot of space to your color choice, yellow is a great place to start. The sunny hue is perfect for the kitchen. In this modern white space, it adds a punch of color, adding a little fashion to the function of this meal prepping area, while taking the whole kitchen up a notch. What's great about yellow is just how cheery it is. There are few rooms that can't be brightened by adding just a little of this smile-inducing color. 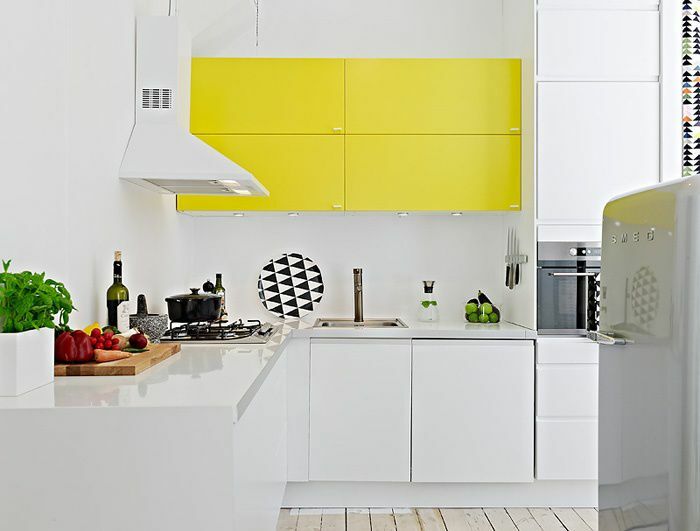 Here, in this eat-in kitchen, the use of yellow offers a clever play on juxtapositions. This neutral-heavy gray space is given a shot of life through the bright yellow cabinetry that sits below the sink. Blue absolutely inspires in home decor. It is a shade that many homeowners like to bring home, for it's cool and tranquil vibe. And when it makes an appearance in the kitchen, blue is sure to have a meaningful impact. These cabinets have been painted a dark, navy blue, adding sophistication to this butler pantry. Brass hardware is also a nice touch. A perfect complement to the deep, blue shade of the cabinets. Now if you aren't the least bit color shy, take it a step further and embrace your favorite tone with a monochromatic kitchen. Here, the cabinets and walls have been painted a bright turquoise. The entire space has been enveloped in the cool shade, giving it a jewel box feel. To design a kitchen as stylish as every other room in your home, look to hues with depth to them. This emerald green shade is a luxurious addition to the kitchen cabinets. With brass hardware, the end result is a space with an extremely high-end feel to it. Colors can also add to the feel of the other elements in your kitchen. These cabinets in forest green add to the refreshing rustic style of this kitchen. The green and white color palette make the space feel large and open. If fire engine red would not be your first choice for kitchen cabinetry, that's probably a good thing. But you may want to think again after taking a look at this kitchen. Red cabinets can be a striking detail in your home's most popular room. This row of bright red cabinets looks quite chic. You can also keep red cabinetry as a statement piece in the kitchen, by using them in just one place. Here, only the kitchen island cabinetry is red. It's a wonderful focal point for an otherwise black and white space. And finally, don't forget about purple. The shade is so alluring. While a bright hue on this cabinetry, purple cabinets can be colorful without being overwhelming. Mix purple cabinets with wood tones for a modern feel. For something a little more delicate, explore the softer shades of lilac and purples paired with gray undertones. In this space, the cabinets add just a perfect touch of color in a shade that looks lovely with the white and gray kitchen accents.